Why Book Budget Kerala Honeymoonr Packages with HoneymoonBug? Located in South India, Kerala, the “God’s Own Country” is a tropical paradise blessed with unparallel natural beauty & picturesque vistas. 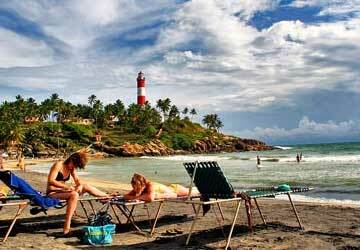 Bordered by Karnataka, Tamil Nadu and the Lakshadweep Sea, Kerala is a beauty with plush natural greenery. With Kerala Honeymoon couples can enjoy a blissful honeymoon in Kerala, sail across the backwaters of Kovalam, visit the tea & spice plantations with decades of cultivation history, and relish the best sea-food from the kitchens of Kerala. Cheapest honeymoon tour packages in Kerala are a great idea to explore this marvelous southern beauty where placidity & beauty go hand in hand. So if you are looking for an ideal honeymoon trip in India, then Kerala is surely the destination for you. 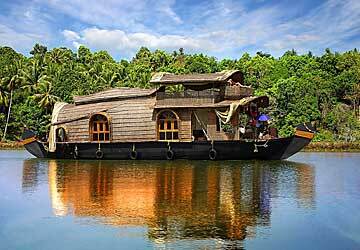 Kochi is a famous destination among couples opting for Kerala honeymoon tour packages from Delhi. With a variety of sightseeing points to boast, Kochi offers a wonderful honeymoon experience to couples looking forward to a blissful time in Kochi. Here you can pay a call to the famous heritage monuments, shop for the world famous Kanjivaram saris, and exotic spices, and visit the lovely beaches. Another popular destination for couples in Kerala is the Hill station of Munnar. Famous for its tea-gardens, spice plantations, and breathtaking gushing waterfalls, Munnar is a destination with soulful beauty. Moreover, with cheap Kerala Tour packages you can also visit the top honeymoon destinations for couples in Kerala including Alleppey Houseboats, Kumarakom Backwaters, Kovalam Beach, Thekkady wildlife sanctuary, Waynadu Hills, Athirapally waterfalls, Marari Beach, Bekal Beach, and Vagamon Hills. Best Kerala tour packages for couples have also got a great option for couples looking for some adventure during their honeymoon in Kerala and enjoy a trip to Periyar National Park, and Eravikulam National Park. 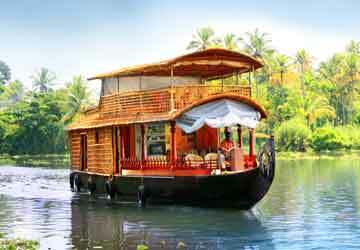 Kerala honeymoon houseboat tour packages are also popular for offering the most incredible cruise experience to couples looking for an incredible experience in Kerala. Couples can also indulge into ayurveda & spa sessions and rejuvenate their mind, body and soul. Budget Kerala Tour Packages are also available from a majority of famous Indian cities including Delhi, Mumbai, Bangalore, Chennai, Chandigarh, Jaipur, Kolkata, Pune, Hyderabad, Surat, and Ahmadabad. The all inclusive honeymoon packages for Kerala offered by HoneymoonBug include everything right from amazing sightseeing tours, hotel stay, to flight, and meals. Book your escape with us now and get ready for memorable honeymoon in Kerala. What should be the ideal duration for the perfect Kerala honeymoon trip? Selection of the right honeymoon packages to Kerala depends on various factors like your budget, main attractions that you want to explore, your priority and timing that you are choosing to celebrate honeymoon. However, the best and ideal duration for the perfect Kerala honeymoon package is 5 nights 6 days and 7 days. You can also choose 4 night 5 days honeymoon package and plan a trip for selected honeymoon destinations in Kerala. Contact a travel operator and you will get the ideal honeymoon package. What To Buy In God's Own Country? God’s Own Country, Kerala is famous for its backwaters, traditional massage and Ayurveda, beaches and wildlife. However, it is also known for something more than what you have heard about. During your holidays in Kerala, you can buy a variety of things that you will hardly find anywhere else. Some of them are coir products, coconut shell handicraft, elephant figurines, Nettipattom, Nilavilakku (traditional lamps), Kasavu Sari (Kerala Sari), Nettur Casket and different other things. You can also get aromatic oil for massage and fragrances. Tea, spices and sandal items are also sold largely. What is the weather in Kerala India? The beautiful state is blessed with a pleasing and enjoyable climate throughout the year across all the seasons and months. From September to March is the warm season that is comfortable enough to explore destinations. It is not humid and hot. March to May is the summer season in Kerala that is hot, but not humid. June to August is the Monsoon season that is humid. Monsoon season is the best time for Ayurveda massages. How to Reach Kerala by Road, Train & Air? Kerala, the God’s Own Country, is accessible by all modes of transport like air, road and train. Kerala has good railway connectivity with almost all states in India. Railway has been connecting state with northernmost district of Kasaragod with its southernmost counterpart Thiruvananthapuram. Varkala, Alappuzha, Bekal and Kochi are well connected by trains. You can also catch Rajdhani from Delhi. Road Connectivity to Kerala is wonderful through state highways and National Highways. You can reach from Mangalore, Mysore and Bangalore (cities of Karnataka). Chennai, Coimbatore, Madurai and Nagercoil are also well connected to Kerala. Overnight journey through luxurious buses is organized by private operators and state transport authority to different cities. Established in 2016 and growing stronger. Over 5 thousand delighted customers & still growing. No need to describe Kerala as a honeymoon destination as everyone is well aware of the natural beauty and serenity here. What is more important than anything else is choosing right honeymoon packages. We got it as we booked 3 nights 4 days honeymoon package Kerala that was wonderful. We got everything we required like most luxurious accommodation, sightseeing tour, pick and drop and most important houseboat ride that was pleasant experience. Tour package that are selected by us also provided us delicious food that we loved. We are recommending this tour package to honeymooners who are all set to tie the knot and planning a romantic trip. I and my wife decided to celebrate honeymoon in Kerala to explore wonderful destinations like Munnar, Thekkady, Alleppey, Kovalam and others. Rather than taking so much hassle, we decided to book a honeymoon package to Kerala. Finally, we decided to book 06 Nights / 07 days special Kerala honeymoon tour (Munnar Thekkady Alleppey Kovalam Package). It was amazing and we got everything before we ask anyone. It was like a royal treatment to us and we go lots of time for privacy and intimacy. Thanks for offering such a wonderful package to us.